Members of the parish assist in the preparation of the garments and linens used for weekly and Sunday Mass at both churches. At Our Lady of Fatima Church, members of the Sacristan Committee take turns picking up the altar cloths, corporals and linens that have been used during the Masses that week. They are then washed according to a special procedure and ironed and returned the following weekend. A schedule is sent out monthly. The Altar Server Vestment Committee launders and irons the altar server vestments at Our Lady of Fatima Church on a rotating basis according to a monthly schedule. Extraordinary Ministers of the Eucharist are parishioners who volunteer, with the approval of the Pastor, to assist in the distribution of Holy Communion at Mass and in the homes of homebound parishioners and at Sprain Brook Manor Rehab. Schedules are distributed by Flocknote and are available at any time on the parish website. Meetings are held as needed. On Holy Thursday all of the Extraordinary Ministers of the Eucharist renew their commitment of service at the evening Mass of the Lord’s Supper. 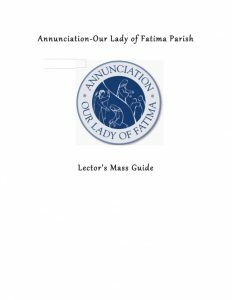 Lectors proclaim the Word of God, read the Prayers of the Faithful and parish announcements at all parish Eucharistic celebrations and special liturgies, including Holy Days and holidays. In their ministry, the Lectors (Liturgical Ministers) share with homilists the responsibility of faithfully and prayerfully sharing the Word with the entire congregation. Schedules are distributed via Flocknote and are available on the parish website. There are currently two adult choirs. They rehearse together on Wednesday nights at 7:00 p.m. and lead song at the high Mass Sunday mornings (11 a.m. at Our Lady of Fatima Church and 12 noon at Annunciation Church). Membership is available to anyone in grades 2 through 8. The choir has a weekly practice on Monday afternoons and sings each Sunday at the 10:00 a.m. Mass, at First Friday liturgies and other special school and community services. The St. Joseph Guild is a group of dedicated parishioners who volunteer to clean Our Lady of Fatima Church. Every other week, a team of two people dust, clean, polish, and straighten up the interior of the church. It takes only about 1-1 ½ hours for the church to look its best and for the team members to feel the wonderful reward of having helped beautify the House of God! Ushering at Annunciation-Our Lady of Fatima is the ministry of welcoming fellow parishioners to Mass and other Church functions and assisting in promoting a respectful, dignified atmosphere for all in attendance. Responsibilities include seating, taking up collections, counting attendance, guiding to Holy Communion, handing out bulletins and helping organize the pews for the next liturgy. If you have an interest in serving the parish as an Usher, please contact the coordinator or the rectory at (914) 779-7345 for more information.